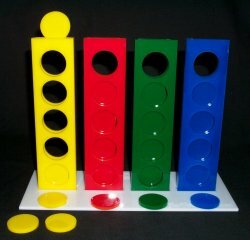 The aim of the game is to fill the columns with coins of identical color. THE POWER GAME offers two possibilities: Colors - Colors and numbers (instruction included). Before starting with the third level games, it is important that the bird assimilates totally the games of the previous levels. The games of the third level require knowledge, reflection and skills which the parrot will have acquired in the preceding levels.